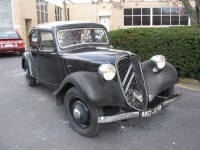 As far back as the early 1930s, Citroën teamed with Yacco, an oil company in France, for endurance testing on Citroën automobiles. These cars were tested at Montlhéry, a track outside Paris. 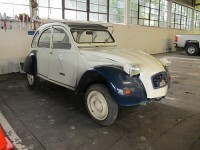 Twenty-five years after production began, the 2CV has been through minor changes. 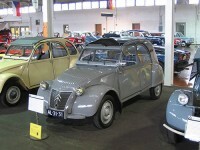 Compare the similarities and differences of this later model 2CV with the older grey model sitting to its right. Citroën wanted to create a four wheel drive car for use in Africa to take the rugged terrain encountered during oil and mineral exploration. Instead of going with a standard configuration, Citroën mounted one engine in the front and one engine in the rear to create four wheel drive. 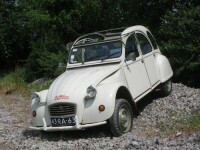 Citroën’s easily adaptable 2CV seemed to be a good starting point for French engineer Marc Voisin to create a true four-wheel drive offering. 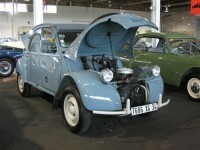 The 2CV “Fourgonnette” (or Truckette) played as important a part of the 2CV story as the car. 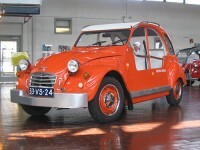 Ultimately, over a million examples were built, which accounted for nearly a third of the total 2CV production. 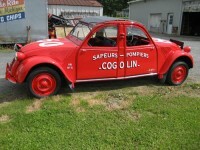 The fire and rescue service in Cogolin, France, were using a Citroën 15-6 as part of their fleet. One night while on patrol, Colonel Hourcastagné found the narrow mountain road blocked. 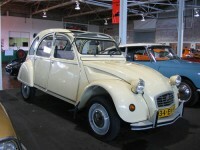 The peoples' car of France, originally developed before WWII, the 2CV did not go into production until 1950 because of the war. 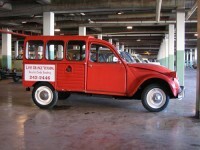 The Citroën 2CV was designed to offer minimal-cost rural transportation. Designers were challenged to build a car that would carry two people and a 250 pound sack of potatoes at a speed of 37 mph. 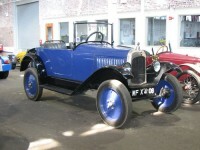 The Citroën 5CV was shown at the Paris Salon in 1921, and production began in 1922. For the first time in France, the marketing was slanted toward feminine clientele, paying off handsomely for Citroën. André Citroën introduced his first car to the public in 1919, and within two weeks received 16,000 orders for the Type a 10CV. The company steadily grew through the 1930s, and André Citroën became infatuated with front wheel drive automobiles and began developing a mental picture of the next car his factory would produce. 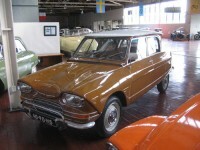 The Citroën Ami 6 was launched in 1961 as “the world’s most comfortable medium class car.” The arrival of the Ami 6 filled the demand for Citroën to produce a middle-price, mid-size car. 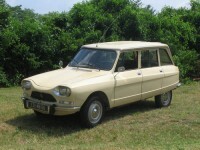 The Citroën Ami 8 was presented to the public at the Geneva Motor Show in March 1969. 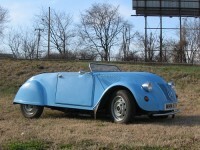 The Ami 8 was far more conventional in appearance than the Ami 6 that it replaced. The reverse-rake rear window of the 6 was replaced by a fastback and the front end got a smoother look. The Citroën Ami Super was launched in January 1973 and, while it looks like the Ami 8, it has a larger, more powerful horizontally-opposed flat 4-cylinder air cooled engine of 1015cc and 55 hp, almost doubling the 8’s power.